Mr. Mein's Classroom: Week 1 is Almost in the Books! Tomorrow will close the first week of your 7th grade year on the Missions Team! 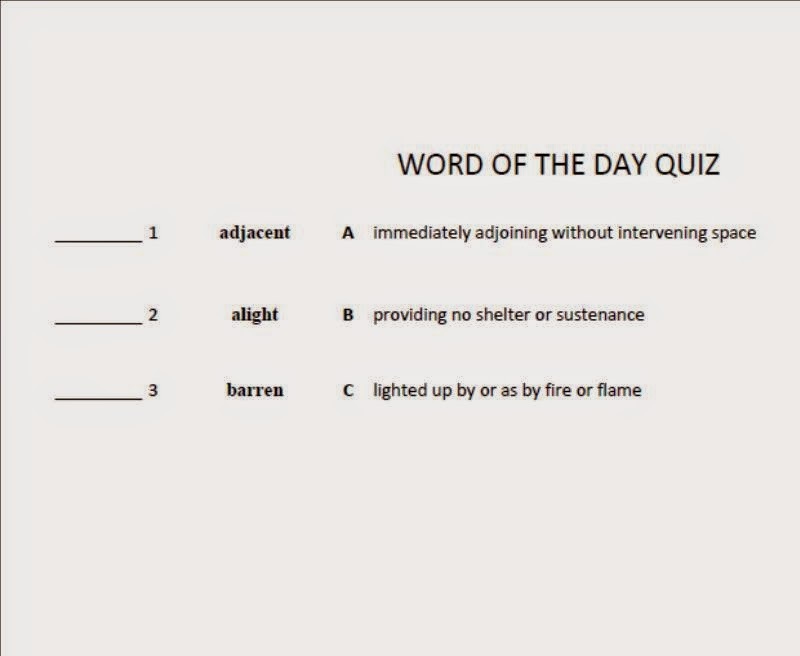 With it being the first Friday, I want to make sure everyone has the greatest opportunity to be successful, so above you can find a copy of tomorrow's Word of the Day Quiz. Take some time to look it over. I'll help you out further- the answers are 1.A; 2.C; 3.B. In addition, you will also have a very easy quiz over the first Writing Rule of the Week: Use correct end punctuation at the end of each sentence. You will only be responsible for entering the correct punctuation mark. I will be posting your first blog assignment VERY soon (as in the next five minutes!). Please familiarize yourself with your blog (http://www.kidblog.org/mein15). Remember, your password is your last name in all caps. You should change your password after you've logged in the first time.